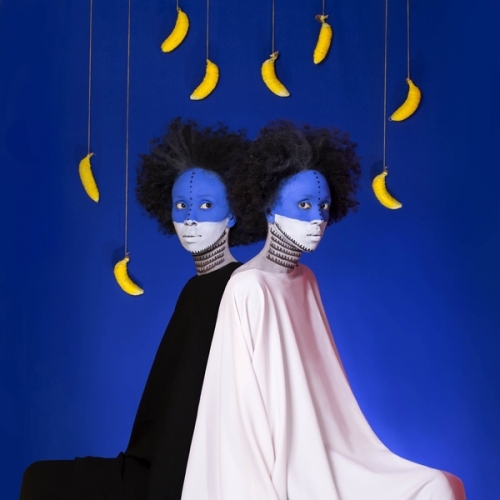 In a selection of three photographs, Ethiopian photographer Aïda Muluneh captures women with painted faces against bright, Pop-esque backdrops. Captive Conscience—Part One (2017) features a woman with a black afro and frock. Her face is painted white with black lines; bars behind her head suggest a prison outfit. The image raises questions about race, challenging the viewer’s understanding of “black” and “white”: the way we describe skin color is as much a fiction as the stark, nearly surreal image. Muluneh’s work is also spotlighted in the latest iteration of the Museum of Modern Art’s influential “New Photography” survey.